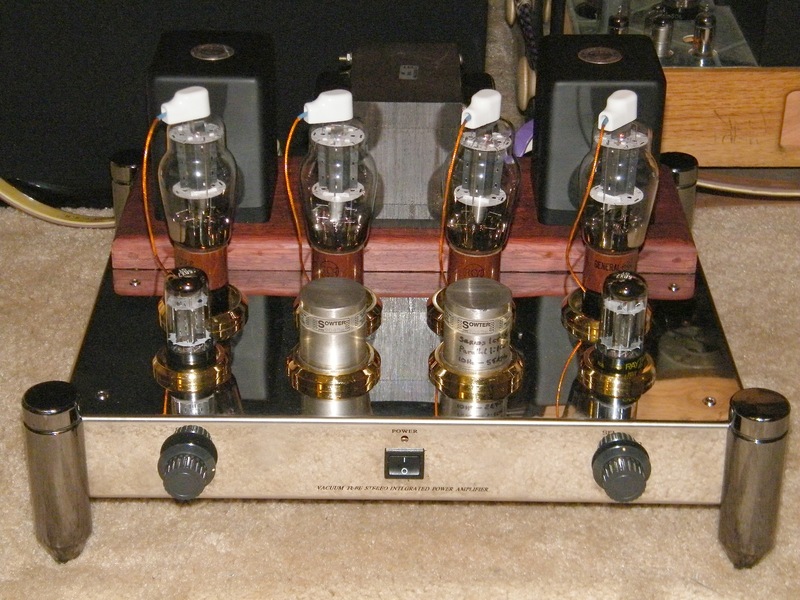 Class A 807/EL34 PP with transformer gain stage. 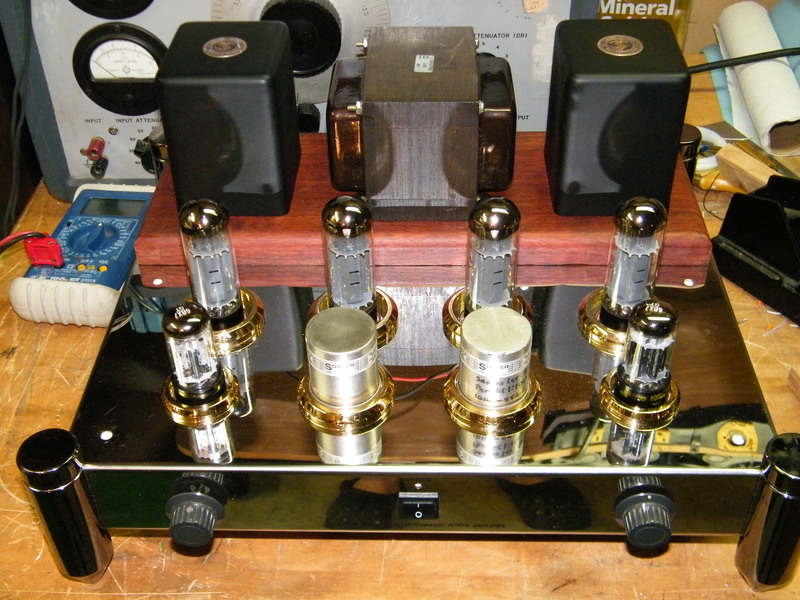 I have pretty much done all I intend to do with tube audio and decided to do a “left overs special” using some good parts I have on on hand including a very “bling” commercial chassis from an amp that had been dropped by Fedex. In particular, I have a pair of Sowter 9045 microphone transformers that are reputed to be excellent. They can provide a gain of 1:5+5 thus creating accurate push-pull phases. Not surprisingly, they can’t swing enough voltage to drive the output stage directly, even using easy to drive 807s and EL34s. However, the additional gain and swing needed is not great and I decided to use 6BX7s for a common cathode push-pull drive stage. As with the transformers, the 6BX7 is known for its audio quality. I also had a suitable One-Electron power transformer on hand, all that was missing was output transformers and I bought a pair of good-quality-for-the-money James 6225 HS units. At $275 for the pair, they do represent good value. The choice of tubes came about because fellow vintage oscilloscope custodian Volker Klocke gave me four good 807s in return for repairing a Tektronix HV transformer for him. If you have read my paper that I published earlier on this blog, you will know that I am a proponent of cascode (depletion mode) mosfet current regulators, largely because of the near total isolation of the audio path from the power supply that they allow when used thoughtfully (Class A only of course). I refer to them as regulators since they are two terminal and can be used either as sinks or sources. They are available as kits from K&K Audio. Starting at the front end, the first challenge was to come up with a neat way to drive the microphone transformers. I knew a cathode follower was the way to go and because there are not enough tube locations on the chassis, I decided to use 5840 sub-miniature pentodes. 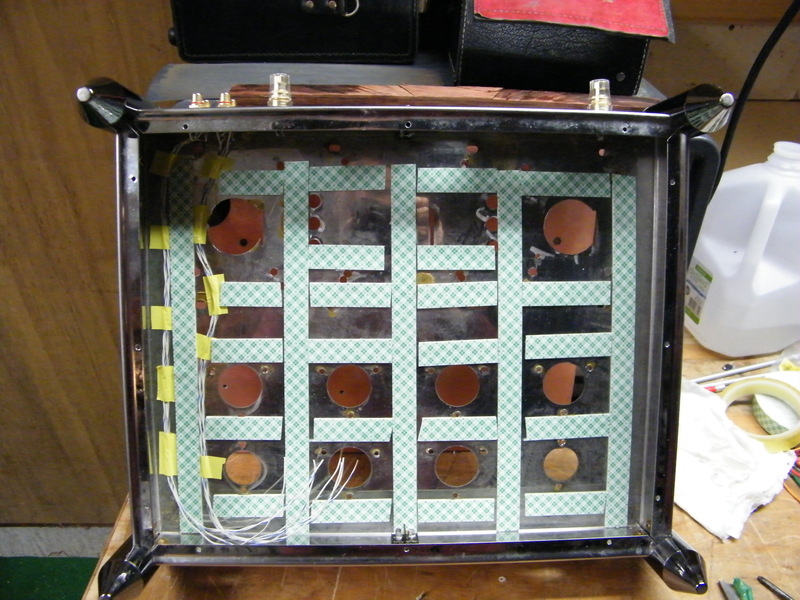 The use of a cascode current regulator in the cathode circuit was a given. The novel aspect is that I know that the way to make a pentode really perform as a cathode follower is to dc couple the screen grid to the cathode because this provides constant transconductance. 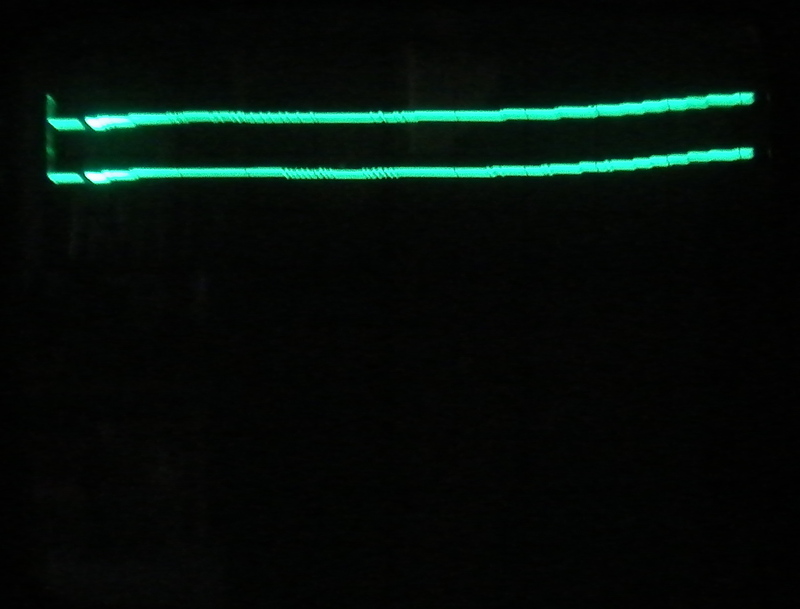 Taking my lead from the tube instrumentation world, I decided to use NE-2 neons. Any noise that they introduce will be non measurable, at least with any equipment in my lab. For the plate current I wanted, 6mA, the screen needs to be at 100V or more (relative to the cathode of course) otherwise the plate voltage will rise towards the limit which I think (senility doesn’t help while writing this stuff) is 160V. 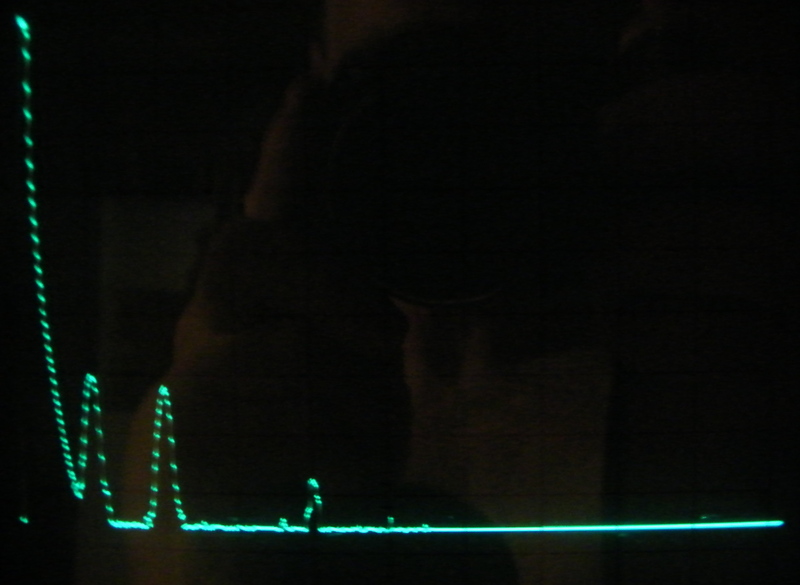 So I used two NE-2s in series, fed by a J509 3mA current diode that having a high impedance, leaves the screen grid completely free to jive with the cathode. I also placed a 47V zener across the diode to prevent the 50V limit for the diode being reached in case of some kind of trouble. In normal operation, the zener is effectively out of the circuit. For good measure – and no better reason than that – I bypassed the two neons with a 1nF cap. After some screwing around with a signal generator, dB meter and oscilloscope, I determined that a 10μF capacitor would be correct for driving the paralleled primary of the transformer. I just happened to having some of those good sounding Russian pink paper in vodka caps, or is it paper in pink vodka? 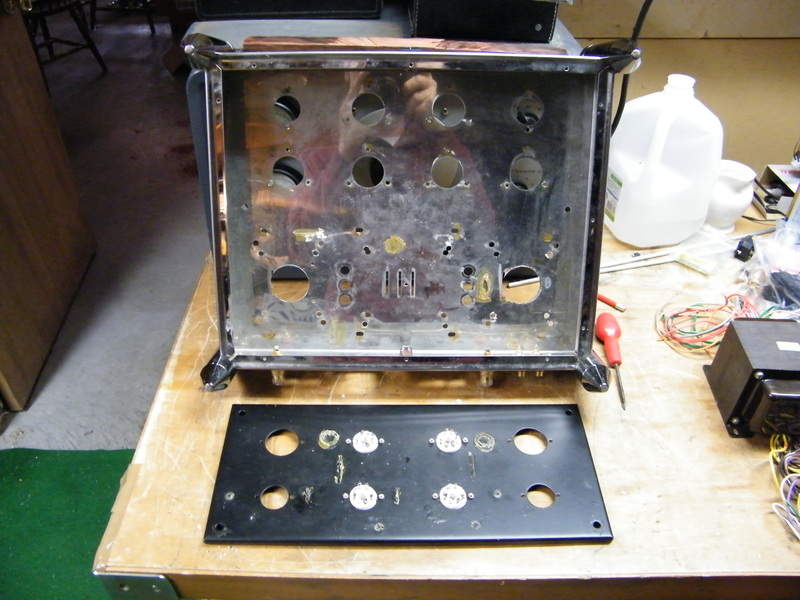 I used a low voltage PSU kit from K&K audio to provide a -20V return for the cathode current regulators. 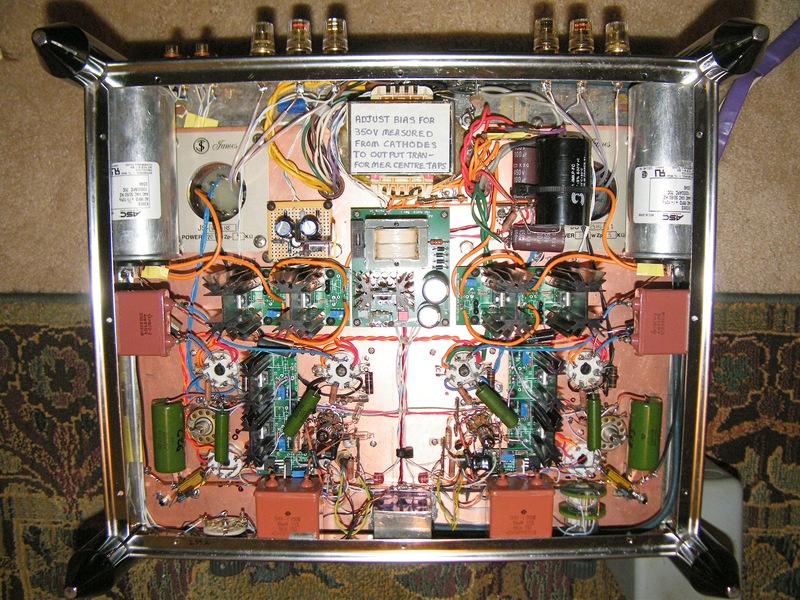 The cascode current regulators also come from K&K Audio. So, now we have 20dB of gain (less 0.6 dB due to the cathode follower and transformer insertion loss) and do not need a great deal more so I chose a 6BX7 for the push-pull driver that has a mu of 10 providing a further 20dB (referred to the push pull output, not one phase). Since the 6BX7 is current fed and the load is due to the 220k grid resistor only, the measured gain actually is 20dB. I chose a bias of 20mA for the 6BX7 sections that with a common cathode resistor of 270Ω results in a plate voltage of around 170V for a new tube. 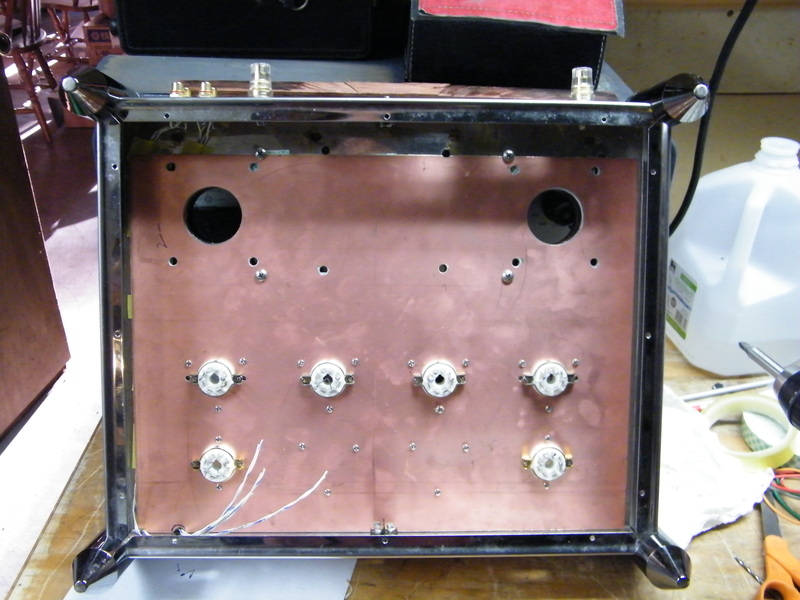 The plates are fed by current regulators from a 230V choke input supply that, further filtered, also feeds the cathode follower. I think there is a real sonic benefit in using such a powerful drive stage even with easy to drive output tubes, I say more about this aspect at the end of this post. Power with the EL34s is 1w at 0.05% THD, 12w at 2% THD, with the 807, the power is a bit less at 10W. Remember, it is Class A. Some commercial push pull tube amps (especially Chinese) that are claimed to be Class A are not. The power supply uses a One-Electron BFT-1 transformer run well with in its rating. The highest voltage taps are used for the +500V supply for the output stages at 240mA while the lower voltage taps are used for a 100mA choke input 230V supply for the drive and input stages. I used the spare 5V and 6.3V windings in series into a voltage doubler and then a LT1085 configured as a 150mA current regulator to power the 5840 heaters that are connected in series. A 2A slo-blo fuse protects the whole thing. Oh, the front end has a nice 20k switched attenuator. It doesn’t have to be 20k, I design for relatively low interface impedances because interconnect cables like that and it keeps noise down. This amp is silent using my 95dB/W/m Tannoys. Talking of keeping noise down, I made a soldered tinplate box to shield the power switch that is bang in the middle of the front ends! I also connected the power switch using shielded wire. Please take the time to click on it to see it properly! 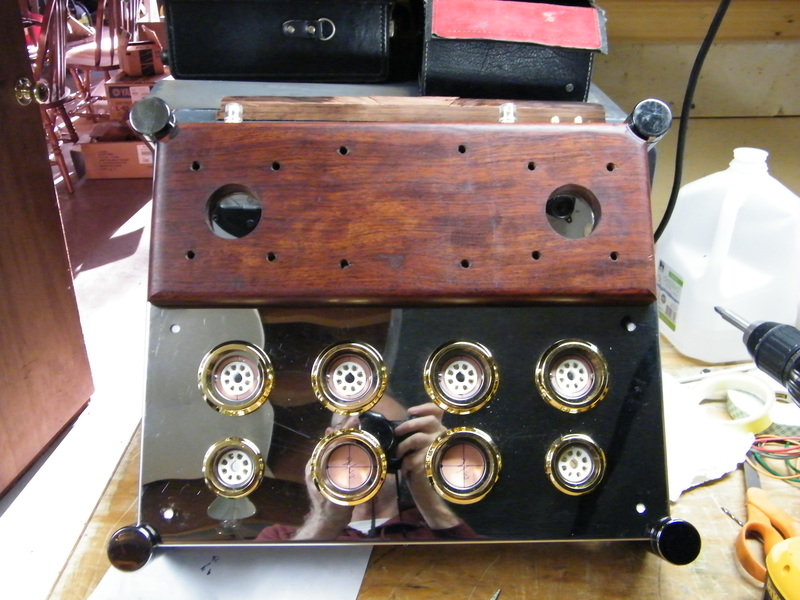 As for the sound, I think it is a good as anything I have done and this being no time for false modesty, I design and build excellent sounding equipment. In particular, this amp has what I can only describe as kick, transients are extremely clear and since a lot of music is transient, this may explain to some extent the good sound. It resolves very deeply, and has marvelous clarity, it just gets out of the way. I think this may be, at least in part, due to the use of a power drive stage combined with easy to drive output tubes. Whilst on the subject of output tubes, good EL34s are excellent. I have built equipment using the much vaunted 845, 300B, 50, 2A3 and 45. Frankly the EL34 doesn’t fall far short if at all, and is MUCH less expensive. I haven’t listened to the 807s enough to form a good impression yet. I have them playing as I am writing this and at the least they make music that way I want to hear it, clear and in the room, not stuck to the speakers. Reproducing music well in a domestic environment is difficult and 100s of watts hinder more than help! Driving my Tannoys this amp is powerful both with the EL34s and the 807s, if loud is what you want. I can’t hear deeply into the music if it is loud. I then got around to repairing my HP 3580A audio spectrum analyser and since the amp can accommodate both EL34s and 807s, I put el34s in one channel and 807s in the other then ran a spectrum comparison at 1W and 8W. The analyser can store one scan digitally then it can be restored once a second scan has been taken, allowing direct comparison. I “should” have repeated the tests after swapping the output tubes between the channels, however, I am not going to! The results are shown purely for the sake of interest though they do seem to reveal that the EL34 actually is cleaner than the 807 at low levels and much cleaner at high levels. It reveals about a 2dB rise overall and notably, the HF performance does not drop off at the higher power. The frequency scaling is logarithmic starting at 20Hz, then 43, 98, 200, the same repeating for the next decades ending at 43kHz. 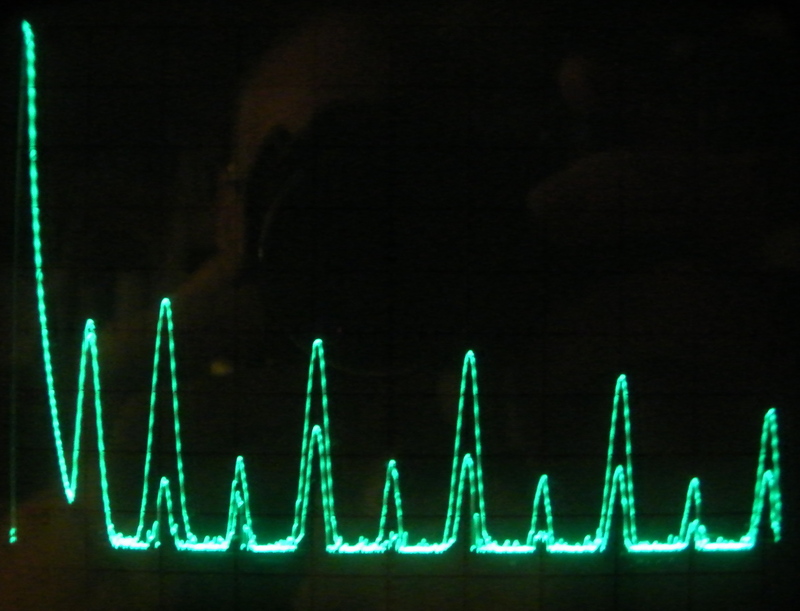 So the dead flat response is roughly over the range 40Hz to 10kHz then rising gently to 43kHz.